"Code name: Sailor V! I have unrivaled style! The soldier of justice, the sailor-suited beautiful soldier, I am Sailor Venus!" Minako is always vivacious and full of energy. She always has romance on her mind. She's a lot like Usagi in a lot of ways. She seems to be more shallow than Usagi because she doesn't seem to have the same compassion and openness that are unique to Usagi alone. She goes to Shibakouen Junior High school, and later Juuban High. In the time of the Silver Millenium, Venus was the leader of the "4 guardians," the Senshi that protected the Princess. But when they were reincarnated, Serena became leader. 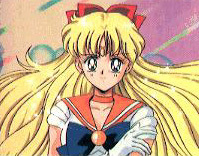 In the manga, Minako acted as the fake princess to fool the enemy and protect Usagi until her identity as the true Moon Princess could be revealed. Artemis gave Minako her powers where she used to live, England. She fought in England as "Sailor V"
She hates it when little kids call her "obasan" (It's a Japanese term used to adress older, married women, not young girls like her) . Back in England Minako was in love with a man named Alan (not that Alan). Her castle is the Magellan castle.